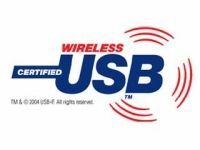 WUSB, Wireless Universal Serial Bus, is a standard for a wireless link to replace the USB2 connection between peripheral devices and the computer or work station in many cases. WUSB (Wireless USB) has a range of 10 metres (compared with 5 metres for USB), with a theoretical speed varying with the distance (480 Mb/s or 60 MB/s at 3 metres, 110 Mb/s at 10 metres). There are adapters for computers without built-in WUSB so that they can use USB2 drivers with full compatibility. The connection is UWB (ultra wide band) from 3.1 to 10.6 GHz with the use of very brief pulses, guaranteeing low energy consumption (half that of USB2). WUSB can therefore coexist with Bluetooth standards (2.4 GHz) and local 802.11a type wireless networks (5 GHz) and 802.11 b and g (2.4 GHz). WUSB bandwidth is 480 Mb/s (60 MB/s) at a distance of 3 metres, falling to 110 Mb/s at 10 metres depending on transmission quality. Wireless security uses 128 bit AES (Advanced Encryption Standard) encryption, based on an exchange of keys of which the code is determined during the first connection, thus preventing hacking by an outsider.